In the quest to tap new sources of renewable energy, scientists are turning to the sun, to the wind, and of course, to a variety of bio-derived fuel alternatives. But in Norway, one company is also turning to salty water. The concept of osmosis may mostly dredge up memories of high school biology. It is the process of moving water from an area with a low concentration of dissolved material, such as salt, to a place with a high concentration, by passing through a membrane. Now scientists at Norwegian renewable-energy company Statkraft aim to use osmosis to generate electric power. It's a tantalizing prospect: Based on an estimate of the number of rivers around the world with suitable conditions, it's a potential source of 1,700 terawatt hours a year of energy globally, according to estimates by Statkraft's scientists. That's equivalent to the electricity consumption for all of China in 2002. In June, Statkraft began building the world's first osmotic power plant, and hopes to have it up and running by the end of the year. Its a 100-square-meter plant, based in a paper-pulp factory near Oslo Fjord and is expected to generate up to four kilowatts of power. If all goes according to plan, Statkraft hopes to have a full-scale plant operational, generating up to 100 megawatts a year within seven years' time. Leveraging the power of osmosis to generate electricity is a concept that has been discussed since the 1970s. The theory is relatively simple: Seawater and freshwater, filtered to remove silt, are fed into pipes which lead to a membrane system, made up of spiral coils to maximize surface area. The salt of the seawater draws the fresh water across the membrane, leading to a build-up of pressure which forces water through the turbine, generating electricity. So why hasn't anyone latched onto it before? "The membrane is the real challenge," says Stein Eirk Skilhagen, vice president of the Osmotic Power project at Statkraft. "We have tested a lot of the existing membranes on the market, but we found that none of them are sufficient for our needs." Existing membranes cater to the desalination industry and haven't combined the two essential features needed for an osmotic power plant, said Skilhagen. The membrane has to be capable of dealing with a very high water "flex," the amount of water that it is able to withstand being pumped across it, and at the same time, be fine enough to keep the salt and fresh waters separate. By tapping some 20 scientists at research centers across Europe, Statkraft eventually found a membrane that can work for a small-scale plant, though it's not quite enough for a larger operation. Statkraft isn't disclosing its secrets, except to say that its magic membrane is made of a polymer similar to plastic and extremely thin. "If you looked at it and felt it you wouldn't be able to spot the difference between it and a sheet of paper," says Skilhagen. It's not enough for a larger plant, though. "Within two years, we hope to make a significant advance in our research," according to says Skilhagen. That's a big improvement from the 1970s, when Sidney Loeb at the University of California, Los Angeles, was working on a process to desalinate water and came up with the idea of using osmosis to generate power. The idea was further explored by Torleif Holt and Thor Thornsen, scientists at Norwegian research center SINTEF. But it gained significant momentum in 1997, when it caught the attention of Statkraft, which had already established itself as a leading player on the emerging-energy scene in Europe. By 2003, Statkraft was testing a prototype so small that one version still sits on Skilhagen's desk. Since then, Statkraft has greatly scaled up the size of its osmotic generators. Statkraft isn't blinkered when it comes to the challenge of making this technology pay off. Even though the plants can be built underground, they're massive; it would take a plant the size of a soccer field to deliver electricity to 15,000 homes. And like other alternative energy sources, power from osmosis isn't exactly cheap. "We simply can't compete on cost efficiency with a gas-fired plant, though I think that we will be able to compete with off-shore wind and tidal projects," says Skilhagen. 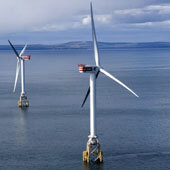 It will cost up to 100 euros ($154) per megawatt hour. But unlike other alternative energy sources, such as sun or wind power, there's nothing fickle about the availability of the key raw ingredients--fresh water and sea water. All that's required is a place where sufficiently salty water meets fresh water, and there are plenty of places that match that criteria near urban or industrial centers, says Skilhagen. Unlike other ocean technologies, generating power through osmosis doesn't involve operating in the harsh environment of, say, a deep sea operation. As the flow of water can be regulated, it's also not affected by seasonal or daily changes in weather or water patterns. The tax breaks and other government supports for developing alternative energy have made Europe the epicenter of renewable energy technology, according to Reese Tisdale of Emerging Energy Research. That support is only likely to increase over time. Last March, the European Union's member countries agreed to a binding target to boost overall renewable energy use by 20% before 2020. And that could be enough time to make power generated through osmosis a part of the patchwork of solutions that will serve energy to Europe, and eventually, the rest of the world. "All said and done, every technology has its hiccups," says Tisdale. "The wind doesn't blow all the time, and the sun doesn't shine through the day. The ideal situation is that our energy needs will be met by a patchwork of technology." Article found on European Water News, written by Vidya Ram on Forbes.com.